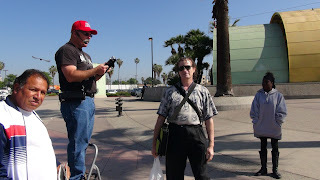 Yesterday, I met a man who was likely the angriest, vilest, most blasphemous heckler I've faced in recent memory. What set him off was the simple declaration of who Jesus Christ is. His spitting anger (I was doused more than once with his saliva), his rage against God and the Bible, revealed the intellectual bankruptcy and lack of integrity of his alleged denial of the existence of God--his atheism. This man, like every other professed atheist, knows that God exists. And like every other atheist, He simply suppresses the truth by his unrighteousness (Romans 1:18). Watch the video, and then ask yourself and answer a few simple questions. Have you every seen this level of hatred toward Santa Claus? Have you ever seen this level of hatred toward the Easter Bunny or the Tooth Fairy? Have you ever seen this level of hatred toward the Muslim god? Have you ever seen this level of hatred toward the gods of Greek mythology? Have you ever seen this level of hatred toward the legendary gods of the Nordic people? If you're honest, the answers to all of the above questions is "no." No one hates, if they are of sound mind, something or someone they know does not exist. So why do atheists, whether with passive aggression or with vehement blasphemy and hostile derision, hate the Creator God of the Bible, while insisting he does not exist? The reason is simple. The atheist knows the God of all creation, the God of the Word of God, the only God who is One and, at the same time Triune (Father, Son, and Holy Spirit), the God who became flesh and dwelt among the pinnacle of His creation--mankind, the Lord Jesus Christ--the God-Man exists, rules, and reigns. But his love of self and his love of sin, the worship of the god he has created in his mind--the god of self, is diametrically opposed to the worship of the One, True God. And he hates the One who has ultimate authority over his life. People, like the man pictured above and who reveals his hatred of God in the video, are not to be feared. Never worry about running into them on the streets while preaching. Never worry about finding yourself in a conversation with an atheist. Whether quietly or angrily, they will soon reveal their belief in God, with futility of mind and foolishness of heart, as they seek to argue away His existence. No, do not fear the atheist. Pity him. Pity his hard heart and sin-soaked, deluded mind. Do not hold him in derision. Do not return evil for evil, hatred for hatred. Love the atheist as you would and should any other neighbor lost in his or her sin. Speak the truth in love, if he will let you get a word in edgewise. But never fear the atheist's arrogant assertion of intellectual superiority, which he believes is evidenced by his insistence that there is no God. And never, ever assume the sinful role of God's defense attorney in the atheist's blasphemous courtroom--a courtroom where he, the convicted criminal upon whom God's wrath abides, attempts to put the Judge of the Universe on trial. Never waste a moment of time or a single breath, never risk blaspheming God yourself, by arguing with the atheist or skeptic about the existence of God. Believe God's Word about every human being's inherent knowledge of God's existence (Romans 1:18-25). Do not blaspheme God through a passive denial of the truth of God's Word by giving any quarter to the atheist's assertion that he does not believe God exists. Stand firm (1 Corinthians 16:13)! God is true though everyone were a liar (Romans 3:4)! Never base your apologetic argumentation upon the unbiblical presupposition that the atheist needs proof of God's existence. He does not. Again, the atheist knows God exists, and he hates Him. Hatred for God reveals the knowledge of and belief in God. Pity the atheist. Pray for the atheist. Plead with the atheist. Call the atheist to repent and believe the gospel. But never argue with the atheist. Never allow the atheist to justify his unbelief at your expense, or at the expense of God's holiness, righteousness, justice, and goodness.